So with my brother's new job he was able to move a touch closer. More importantly, his new job has him working in my town, facilitating some gaming. 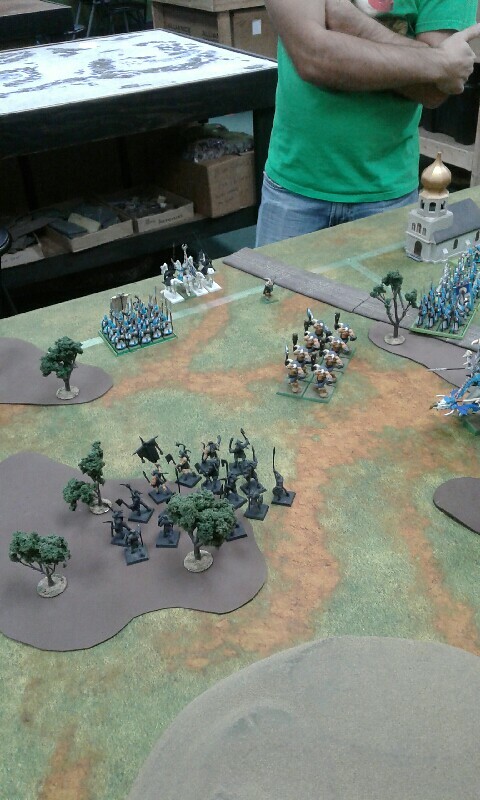 We had noticed at one of the last times we played that our High Elves and Beastmen have never faced each other, and we had made a plan to rectify that situation. We'd like to mention The Sage's Shoppe where we gamed at, who have already agreed to host a Classichammer day or two each month. Okay, onto the meaty parts. Going through the book we decided to play scenarios that we hadn't gotten around to playing. We settled on Flank Attack, the 4th scenario in the rulebook. 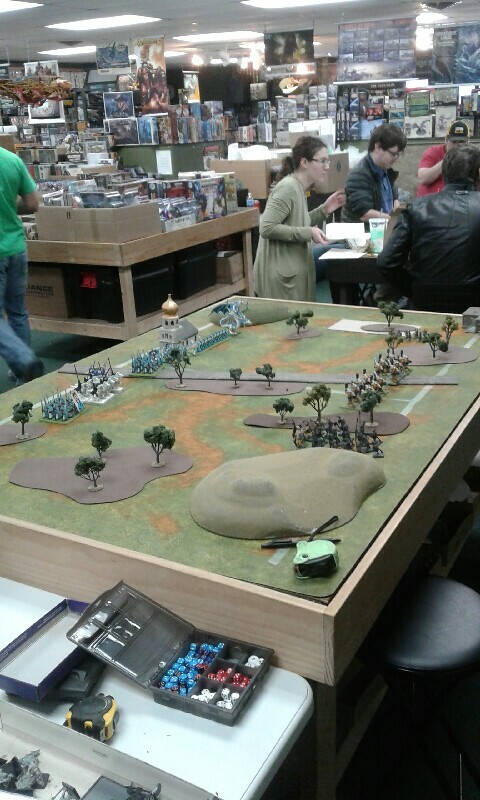 The attacker (Me, after a roll off) keeps a third of his army in reserve and starts rolling on Turn 3 to be able to come in on a pre-selected table edge. We decided that it would be best to choose the table edge AFTER deployment as he acknowledged that most people would castle on the opposite board edge. I decided that the Enemy deployment board edge was off limits, as this was a FLANK attack. Terrain was a bit on the brutal side and kind of hampered how I would have deployed. THIS is pretty much what I went with. 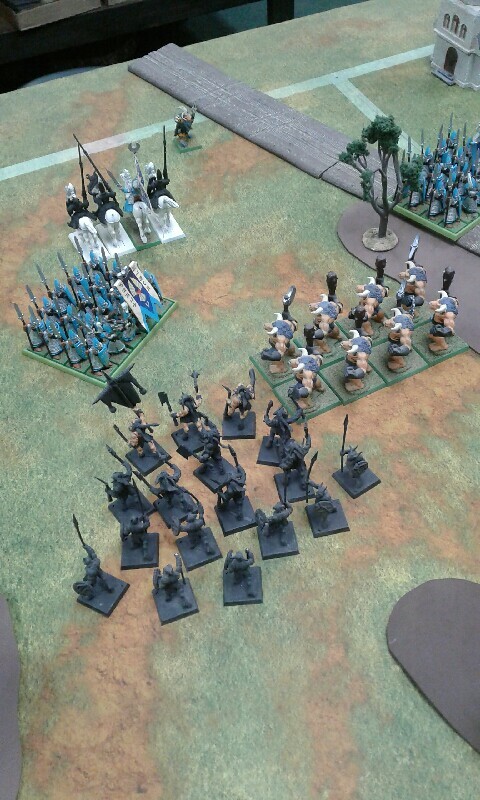 The High Elves deployed as such, with their Shadow Warriors behind the trees on my right flank. 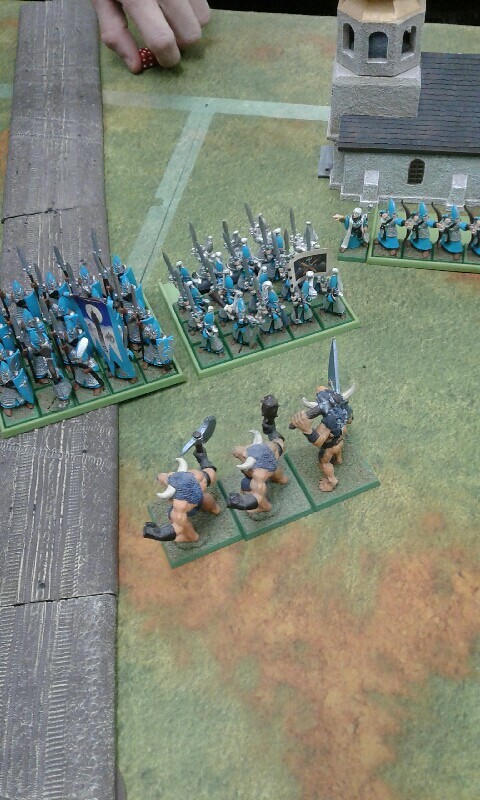 I opted to have the Wargor and his Bestigors in reserve alongside a Minotaur regiment. Since I finished deploying first, I got +1 for the roll to take first turn. Naturally I roll a 6 to Ashley's 2. COMMENCE!!!!!!!!! The Unruly nature of the Beast Herd is kept in check as the Brayshaman guides it through the clearing between the woods, calling out to the Minotaurs next to him to do the same in their clearing. The Doombull's Minotaurs proceed on the OTHER side of the forest, clearing the woods that the Shadow Warriors are hiding behind. Moving to the Magic Phase, 1 Silver Helm falls to Creeping Death, and the Brayshaman then uses Steed of Shadows to fling himself to the other side of the Silver Helms, well outside of any charge range. 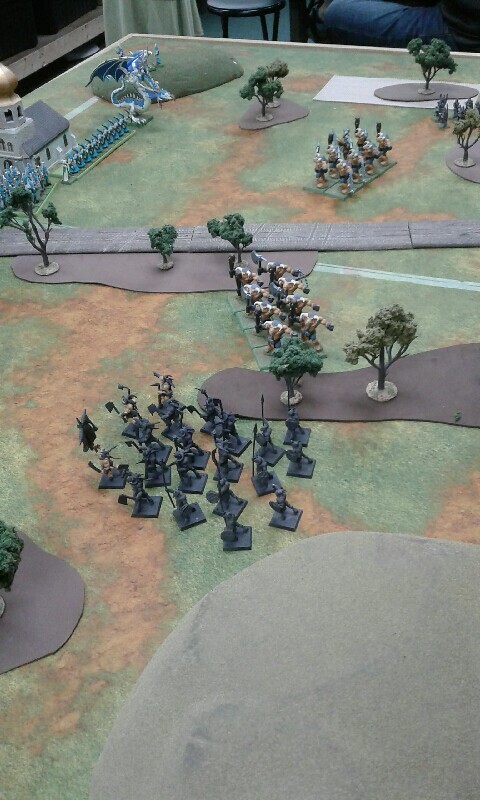 The Silver Helms declare a charge on the Beast Herd, and they hold in anticipation of the taste of Elven meat. 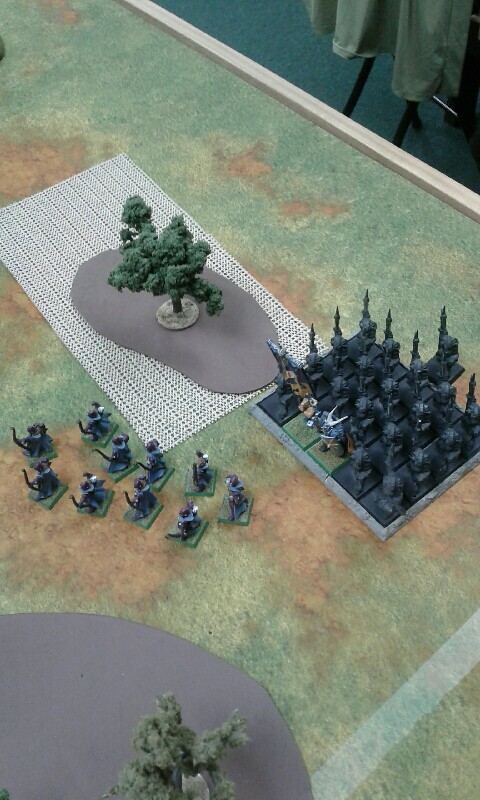 The ranged elements stand fast as the rest of the army moves forward roughly 5". 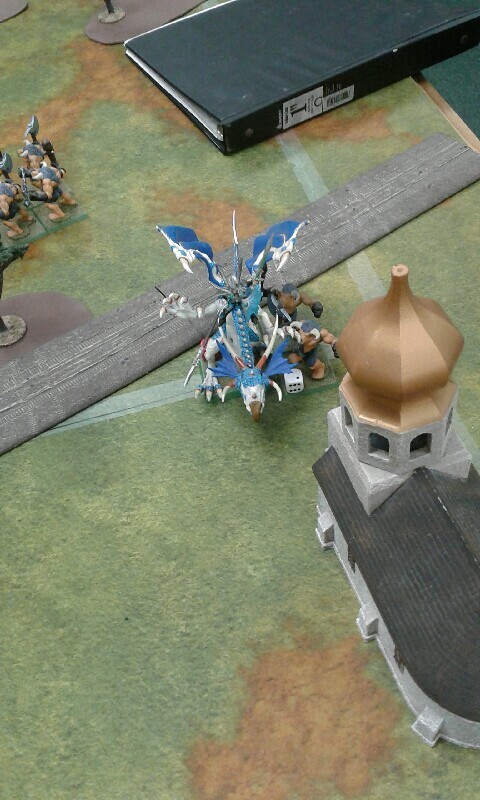 The Dragon flies forward to the flank of the Doombull's Minotaurs, preparing a gout of flame. The Mage focuses on casting Fury of Khaine on the Doombull's Minotaurs, but his youthful inexperience prevents him from succeeding at casting the spell. He then tries the much easier Drain Magic, but the Brayshaman dispels it effortlessly. The Shadow Warriors let loose their deadly fire, but only two arrows find purchase in one of the Minotaurs protecting the Doombull. Flames spew forth from the Dragon, and the wounded Minotaur takes the flames meant for his brethren, sparing their lives with his sacrifice. 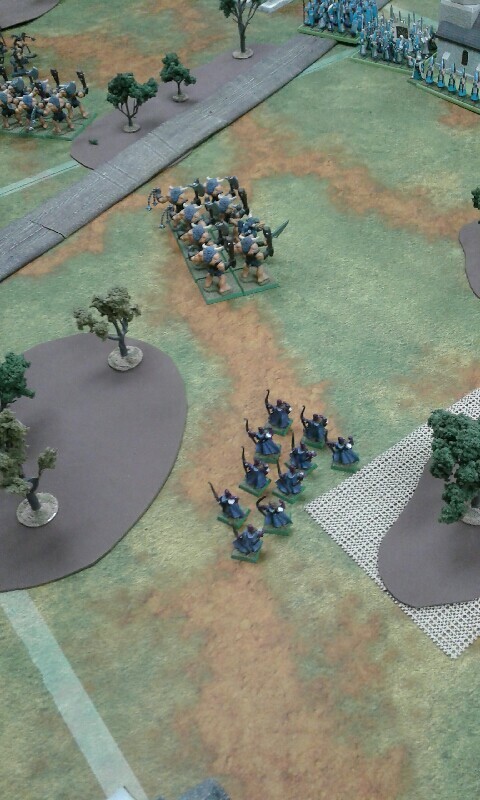 The Bolt Thrower fires a barrage of shots, but only manages to wound the regiment twice. The stern snort of the Doombull ensures that none of the Minotaurs panic. The Silver Helms bear down into their lances, but find a foe far better trained than they had expected, only 2 Gors fail to avoid the incoming attacks, while their weapons beat furiously yet uselessly against the Elven armor. 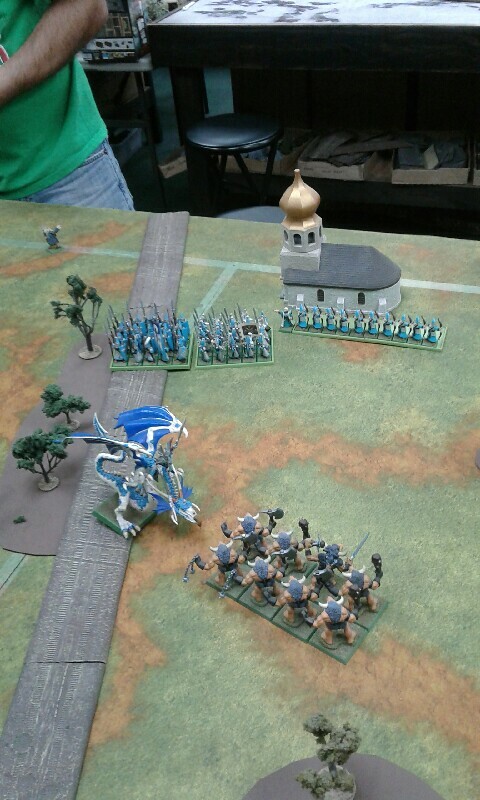 While the press of battle has swung in the favor of the High Elves, the nerve of the Beast Herd holds. 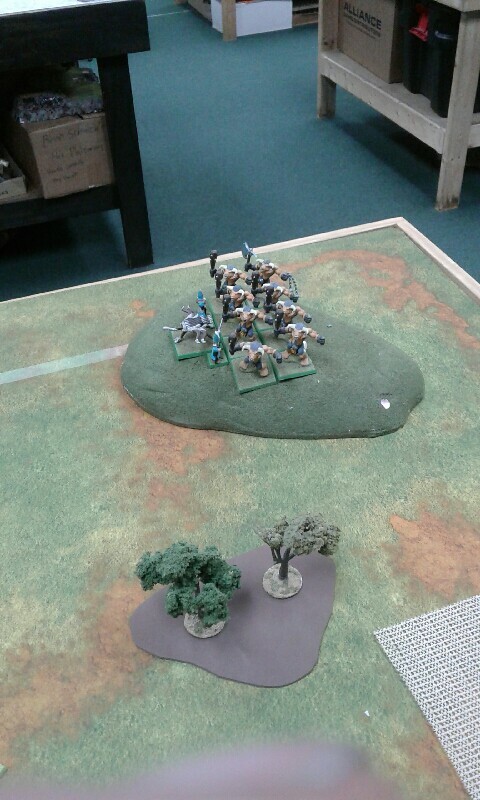 A mass of roars sound as the Minotaurs charge the flank of the Silver Helms, yet the brave horsemen's resolve holds. The Brayshaman shambles towards the Mage's Archer regiment. 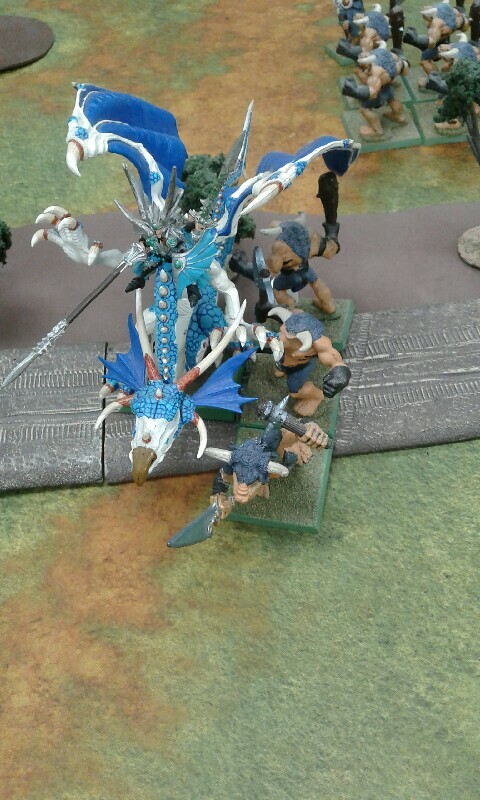 The Doombull snarls, and the Minotaurs reform around him to face the Prince on Dragon, daring him to charge. The Brayshaman chants Creeping Death at the Swordmasters, and two of them fall. As he attempts to summon the Steed of Shadows, the Mage utters the correct words to dispel it. On the far side of the battlefield the Minotaurs swing their great weapons in wide arcs, smashing 3 of the Silver Helms to the ground. One sword strike sees a Gor pierced through the heart, yet his bretheren pull down 2 more of the noble Knights. Fear fills the hearts of the Silver Helms as they flee 14" from the Minotaurs, yet the Minotaurs can only manage to pursue 8" while the Herd pursues 5". 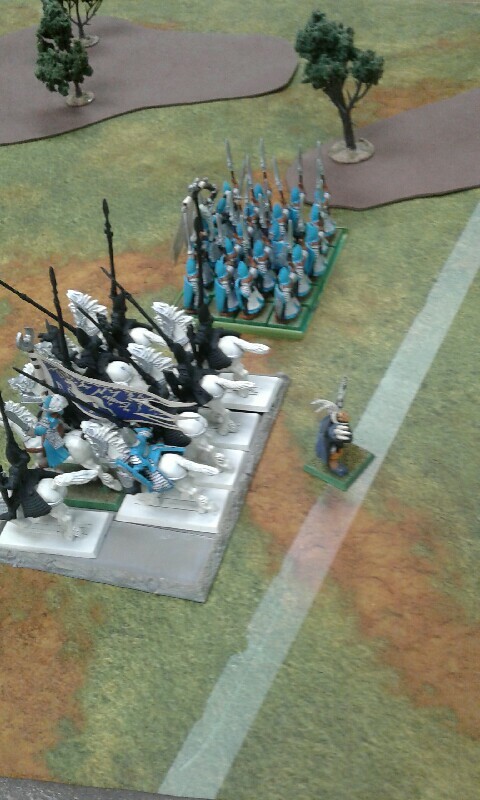 Panic fills the Spearmen's hearts as they watch the Silver Helms break, and they flee 6" lest they suffer a similar fate. The Silver Helms, however, sound their trumpet and reign in their steeds, reforming to face the Minotaurs again. The Prince pulls the reins of his Dragon, prompting it to fly beside the Beast Herd. 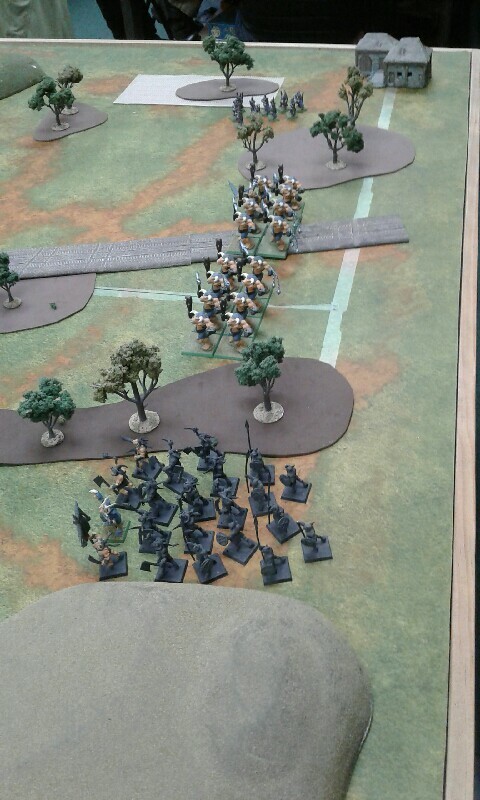 The Spearmen and Swordmasters on the other flank gingerly edge forward 1", unsure of whether to engage the Doombull's regiment or not. The shooting units brace themselves to release more airborne death. Once again the Mage fails to cast Fury of Khaine, and once again the Brayshaman dispels Drain Magic. 3 arrows from the Shadow Warriors find their mark, dropping one of the Doombull's Minotaurs to the ground. Two arrows from the Archers also find their mark, killing the wounded Minotaur and wounding another. The Bolt Thrower then manages to hit the newly wounded Minotaur twice, felling him. The Doombull snorts at the Minotaurs and they hold their ground. 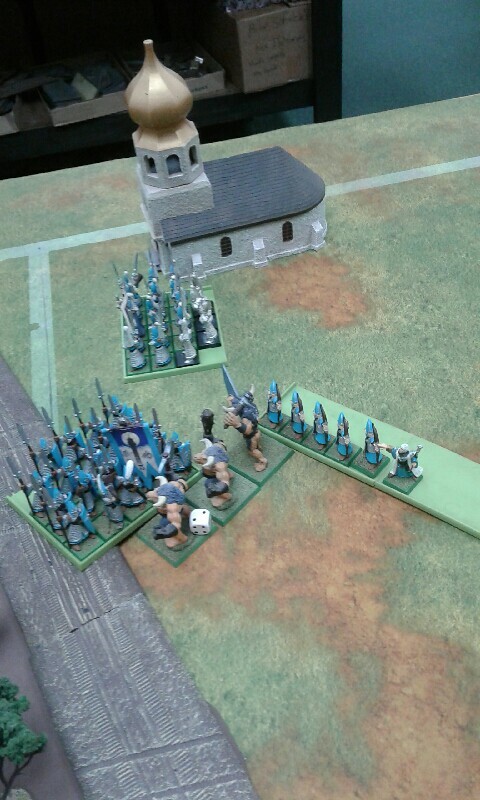 On the other side of the battlefield, 4 Ungors die in flames as their regiment coolly holds their ground. A roar sounds from the East as the Minotaurs of the flanking force move 12" onto the table, facing down the stoic Bolt Thrower crew. 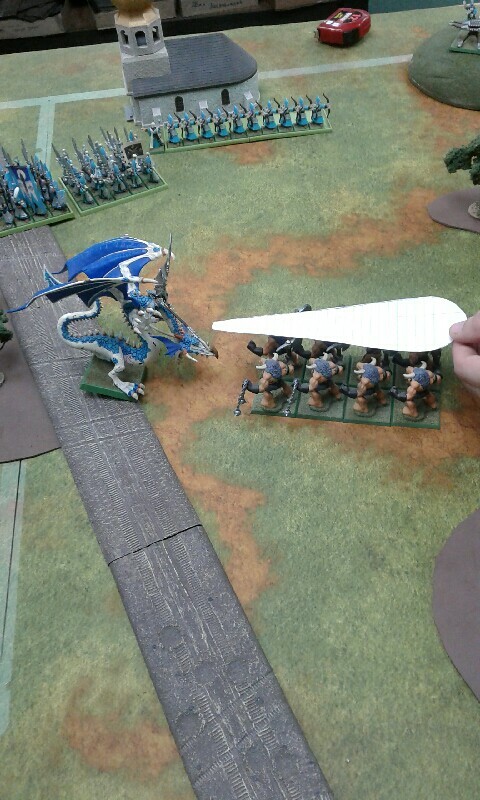 On the other side of the board, the Beast Herd flees 9" in Terror at the sight of the mighty Dragon. The Silver Helms flee 8" in Fear as the Minotaurs charge towards them. The Minotaurs then try to redirect their charge into the fleeing Spearmen who flee another 3", outdistancing the Minotaurs' charge range, leaving them at the halfway point, bewildered as to where to go next. The Doombull prompts the remnants of his regiment forward at maximum speed to gain ground towards the Elven battle line as the Brayshaman moves closer still to the Mage. Chanting Creeping Death, the Brayshaman lays 2 Silver Helms low, but is again prevented from forming the Steed of Shadows by the Elven Mage. The Beast Herd shrieks in despair and begins an all out rout as the Dragon flies towards them. They stop at the edge of the treeline, just short of cover, as the flames and claws of the beast strike them down from behind. 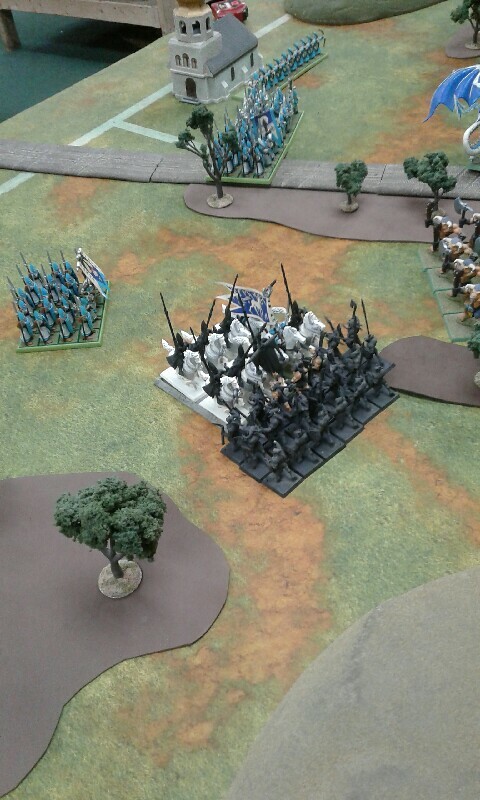 Directly behind this small victory, the remaining Silver Helms and the panicked Spearmen regiment flee the table. 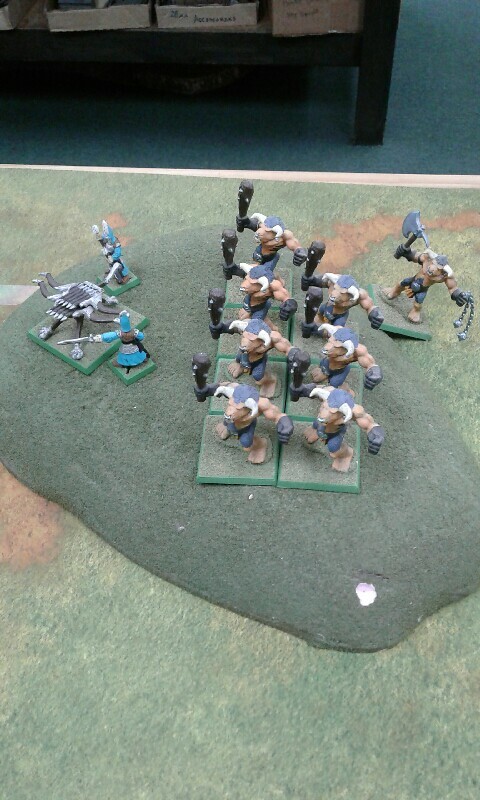 The Spearmen in the center of the board charge forward into the Doombull's regiment. 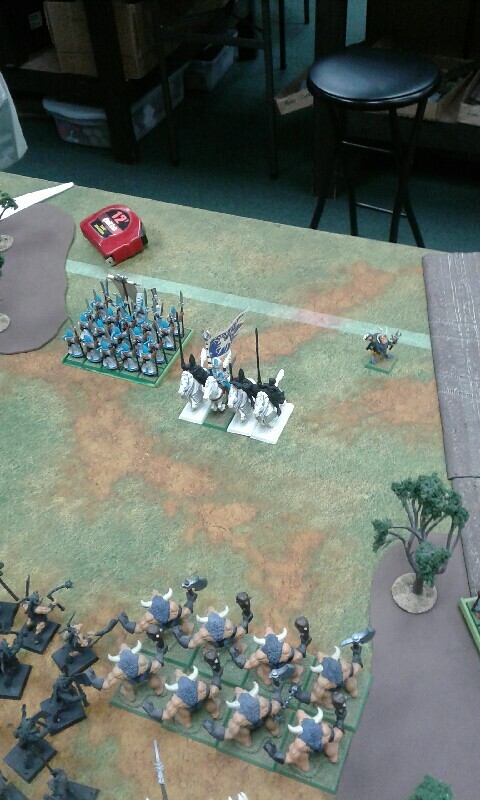 The Archers, sight and charge path obscured by the Swordmasters, charge the flank of the Doombull's regiment, face to face with the Doombull himself. Both regiments easily overcome their fear to meet this threat. 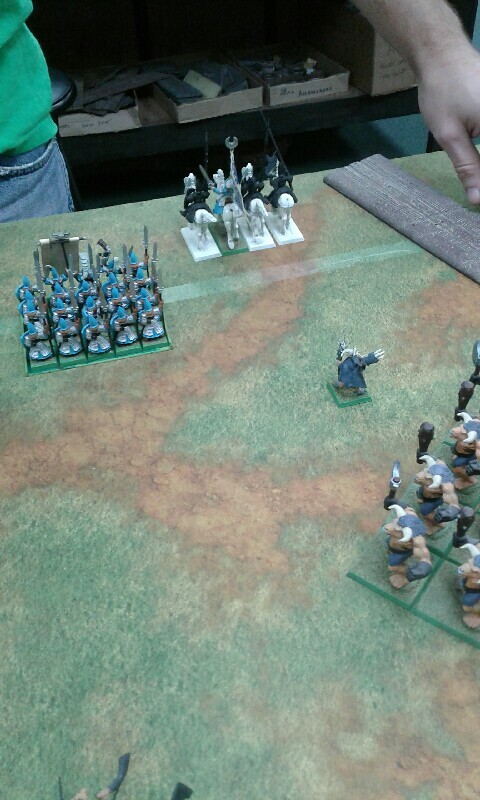 The Swordmasters reform to face the Bray Shaman and Minotaurs from the left flank. The Bolt Thrower and Shadow Warriors stand fast. Drain Magic is easily dispelled. The Bolt Thrower manages to only wound one of the Minotaurs now facing them, with the Shadow Warriors unable to land a single shot. None of the Spearmen nor the Archers land a single blow against the Doombull and his unit, meanwhile 5 Archers are slaughtered by the Doombull while 1 Spearmen falls to a Minotaur great weapon. Surrounded, a snarl from the Doombull keeps the Minotaurs in the fight. The Doombull turns his ear to the East, but does not hear the trumpet of the Bestigors. 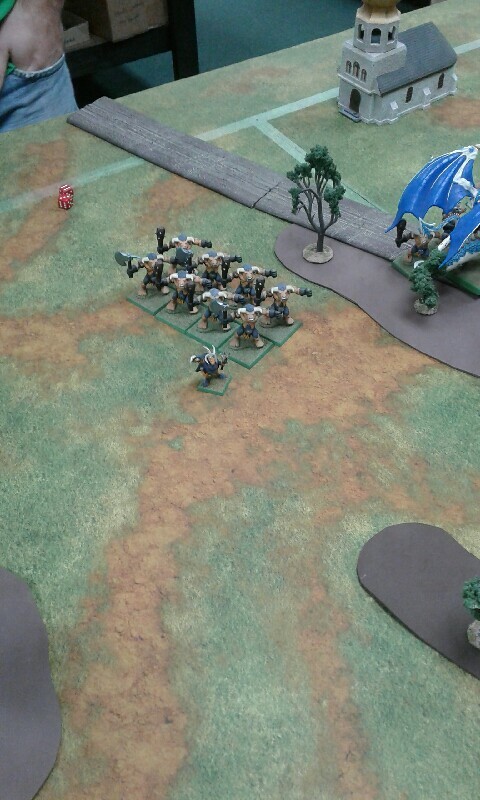 The right flank Minotaurs charge into the Bolt Thrower crew, who fight their Fear and hold. The left flank Minotaurs reform towards the Dragon as the Brayshaman moves at best speed toward the monstrous creature. The Brayshaman attempts to cast Creeping Death on the Dragon, but the Mage dispels it. Furious, the Brayshaman can't concentrate enough to conjure the Steed of Shadows. The Bolt Thrower crew is slaughtered by the Minotaurs, who stop atop the hill to devour the hapless Elves. The last 5 Archers fall to the Doombull's flurry of attacks. 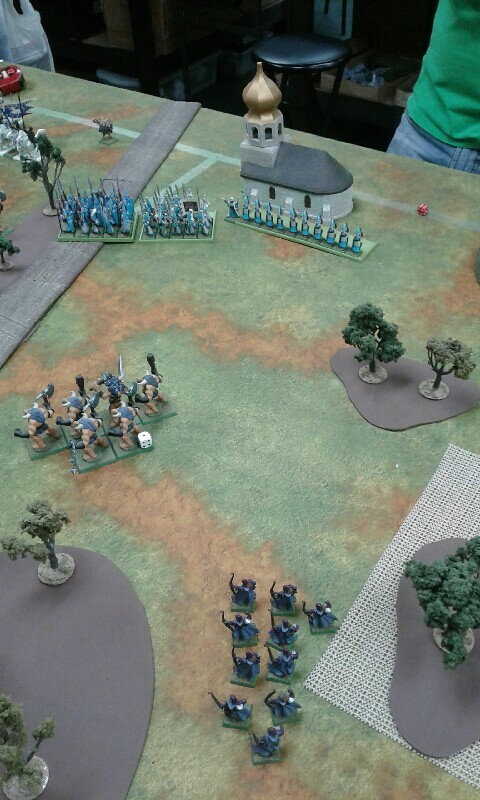 The Spearmen fail to strike, unnerved by their kinsmen's demise. 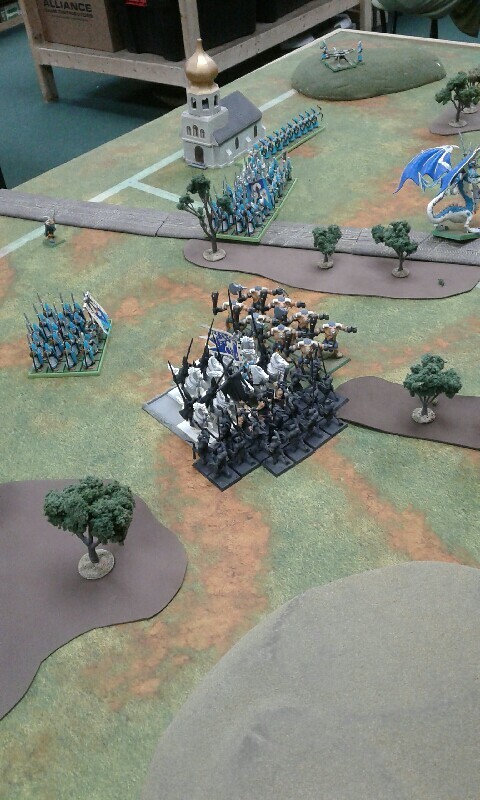 The Minotaurs swing into the Spearmen, accounting for 4 of them. The resolve of the Spearmen and the Mage break as they flee 6" from the enraged Minotaurs, with the Doombull's regiment pursuing 10" and slamming into the flank of the Swordmasters. 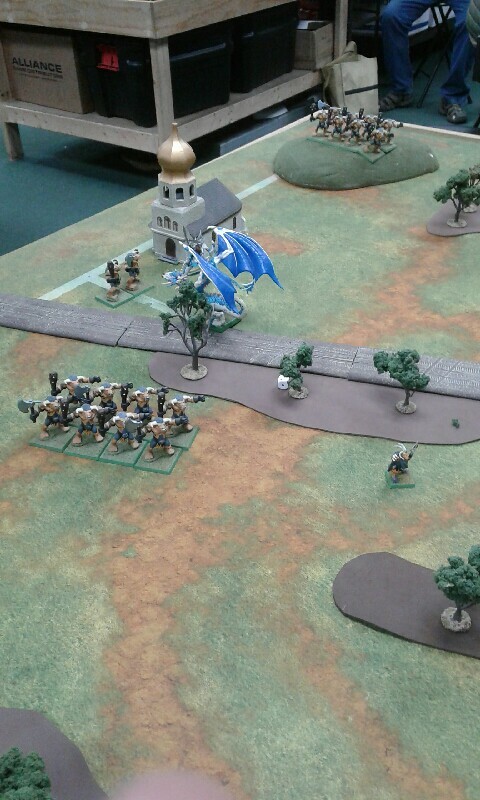 The Prince spurs his Dragon to the sky, landing near the front of the Doombull's regiment. The Shadow Warriors wait patiently. The Swordmasters lose 4 members to the assaulting unit, and without the ability to fight back promptly flee 5", with the Doombull's unit pursuing 7". The Doombull's ears perk as a baritone horn bleats from the East. 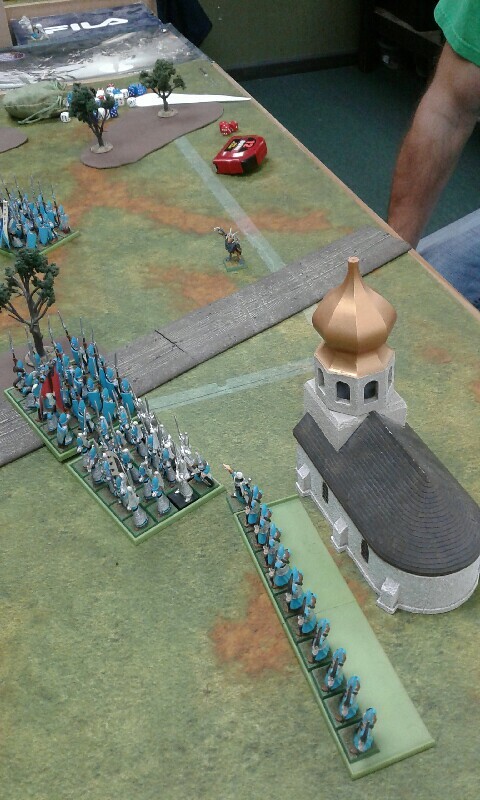 The Bestigors and Wargor have found the battlefield, marching on behind the Shadow Warriors. 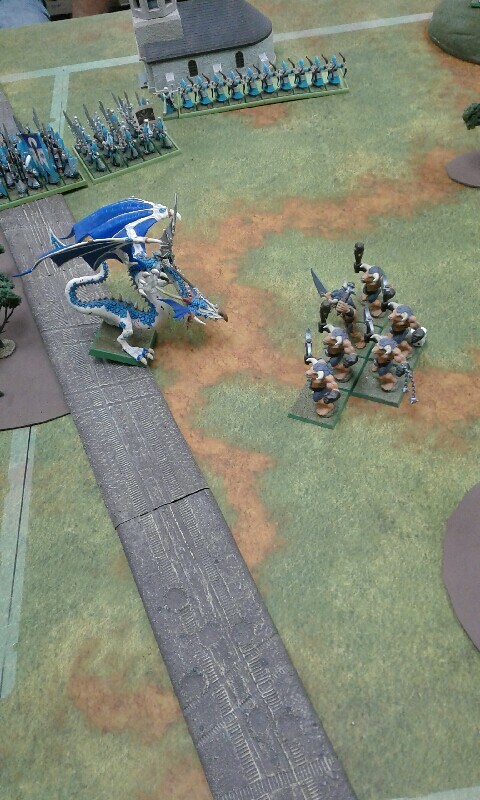 The Doombull growls and charges the Prince on Dragon, intent to avenge the Minotaurs lost today. The Brayshaman moves 10" towards the Shadow Warriors, prepping for any possible way to sway the battle. The Brayshaman fails to cast Steed of Shadows. The Prince points the Blade of Sea Gold at the Doombull, challenging him, which the Doombull gladly accepts. None of the Doombull's attacks get through the Prince's magical armor, and the Prince can only manage 1 wound in return. Draw. 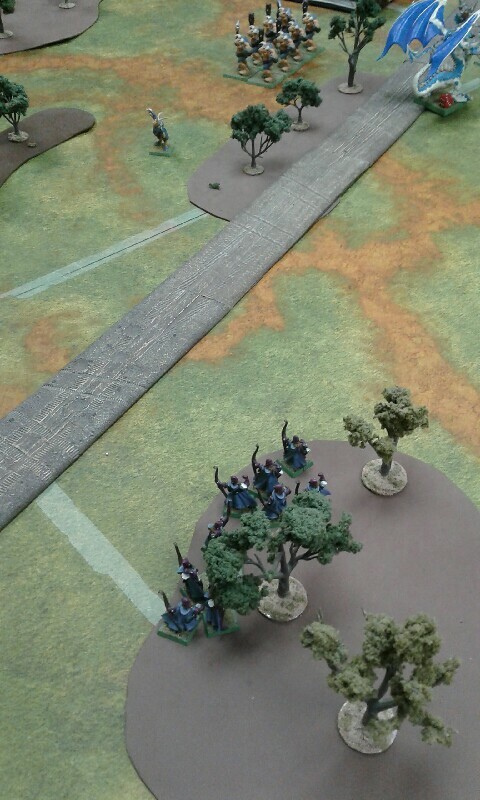 The Shadow Warriors advance at top speed into the woods ahead of them, seeking any cover and concealment available. The Prince lands another wound on the Doombull, with the Doombull landing one in return. The Dragon then takes the remaining 2 wounds from the Doombull, and the combat is won. The Minotaurs left flee 11", with the Dragon pursuing 7". 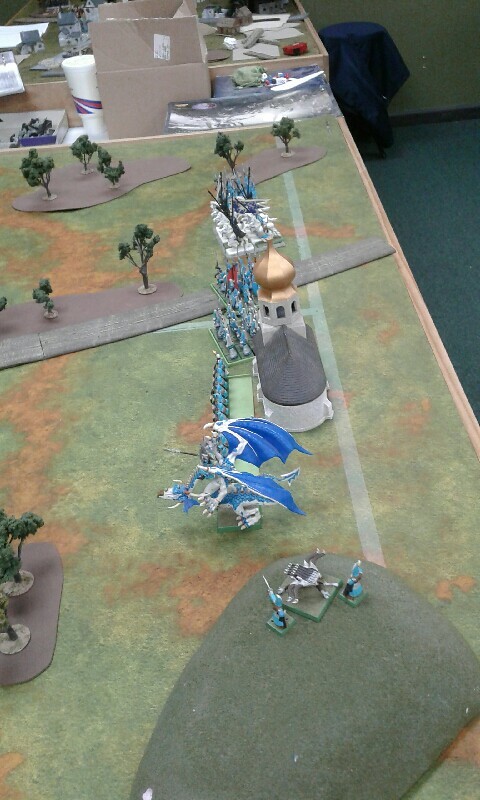 The fleeing Minotaurs rally, prepared for the Dragon's charge. The Brayshaman moves at top speed towards the Shadow Warriors, while the flanking Minotaurs stand still. Creeping Death is dispelled, and the Brayshaman fails to cast Steed of Shadows. The Prince commands the Dragon to charge the two Minotaurs, who hold. The Shadow Warriors let loose with their shots, felling the Brayshaman. 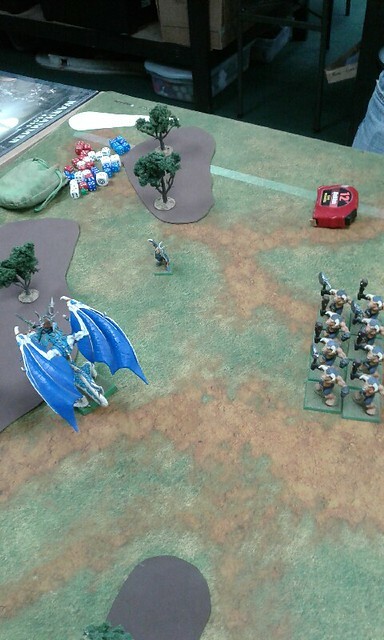 The Prince and Dragon manage 4 wounds on the Minotaurs, with 1 on the Prince in return. 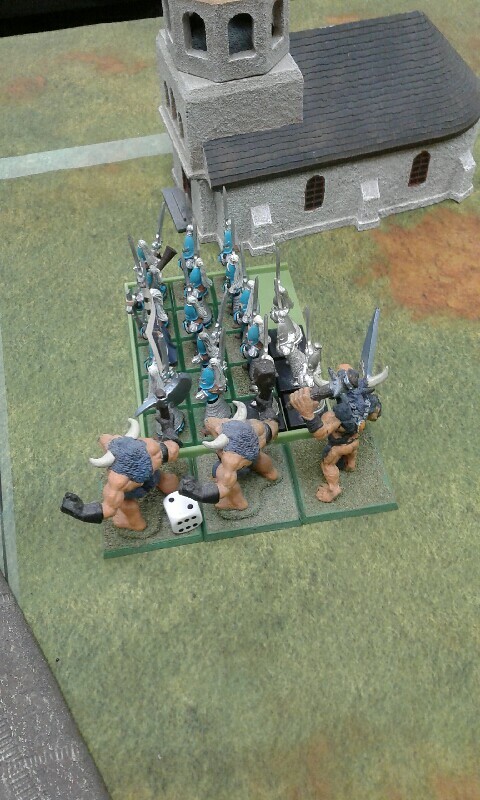 The Minotaurs are easily pursued off the board. With that, the Beastmen have far more holding the table than the High Elves. It is a victory, to be sure, but a bittersweet victory for the followers of the slain Doombull. I have to admit, when I saw how little my footprint on the board was, and how split my attack was going to be, I immediately declared that I couldn't win this game. I stuck it out because I was there to play, and even getting housed can be fun if the game itself plays out in a fun manner. Ashley had some less than stellar rolling when it came to some key break tests, but even with Insane Courage as a houserule, the breaking from Fear causing units did more damage than I think he was prepared for. For a first outing, I think it did well. However, he will have time to plan, and I doubt I will have it as easy next time. Nicely done and a good report. Hopefully you can get out more to the shop and show those damn kids next to you how gaming is done. All in all, I think this game drove home how certain "unstoppable" units or combos were quite stoppable, or didn't generate the autopilot win that you hear about so often. Truth be told, I wouldn't have ran that High Elf build myself. 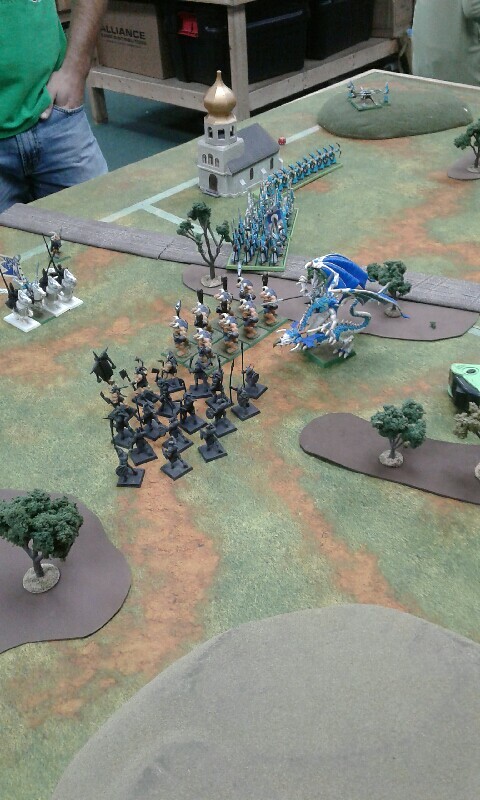 I'd also run Tzeentch on every unit able to be Marked if we hadn't agreed to go magic light for this match. With no shooting, magic is about the only way to thin out units before the Minos get there.